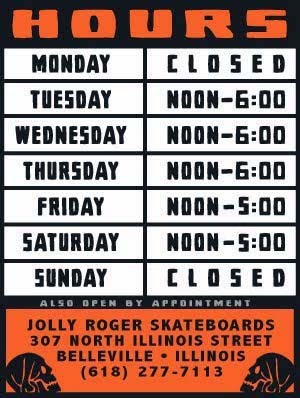 Jolly Roger Skateboards: JOLLY ROGER: Print Party This Saturday! JOLLY ROGER: Print Party This Saturday! 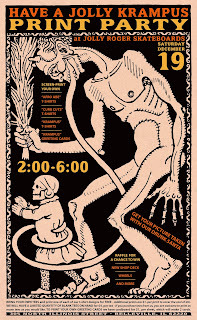 Make your own Christmas gifts at our "HAVE A JOLLY KRAMPUS" PRINT PARTY on Saturday, December 19th. You will have a chance to screen-print your own tees and greeting cards from 2:00-6:00pm. We will also be having a raffle for a deck, wheels and more. And if he is able to get off work our drunk Santa will be there so you can get your picture taken with him. • BRING YOUR OWN TEES and print one of each of our t-shirt designs for FREE - Additional prints are $1. per print to cover the cost of ink. • WE WILL HAVE A LIMITED QUANTITY OF BLANK TEES ON HAND for $4. per tee - If you purchase tees from us, you are welcome to print as many tees as you would like. • TO PRINT YOUR OWN GREETING CARDS we have cardboard for $1. per sheet, which will make 2 cards. 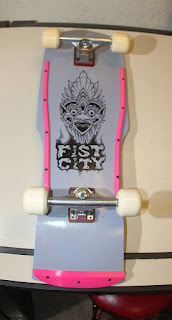 • We will also have a RAFFLE for a FIST CITY complete, JOLLY ROGER deck and GUANO Wheels. Raffle tickets are $1. a piece. Get there early to get in on the raffle. It will be going all day until everything is gone. 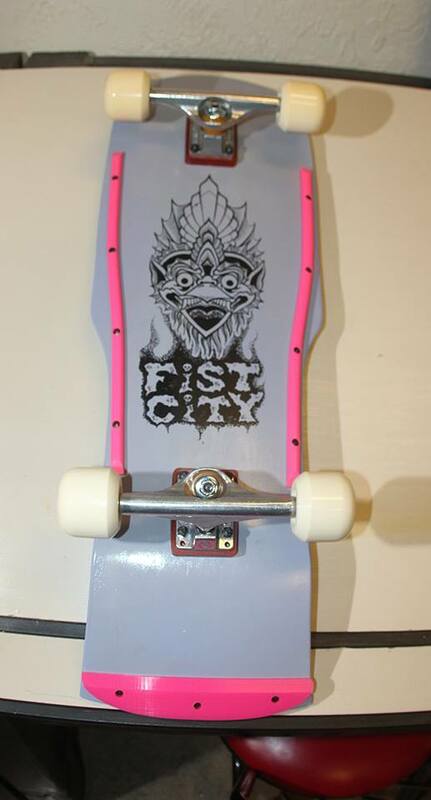 Special thanks to FIST CITY SKATES for donating this complete skateboard to add to our raffle that will be going on during the Print Party. This deck was shaped by local tattoo artist Don Will, he did the graphic and it was printed here at the shop. It comes with Indy 169's, Zorlac Deadbolt rails, Powell Tail Bone and old school wheels. And we just did a test run of our "Have A Jolly Krampus" greeting cards. Swing by and screen-print your own during the party. The chipboard is $1. per sheet and you get two cards out of it, so you can get greeting cards that you screen-printed yourself on the cheap.